signotec GmbH will take part at the it-sa India – India’s IT security expo and conference. Offering a first-class security, the signotec products find a perfect fit at the exhibition. It takes place at the Bombay Convention & Exhibition Centre in Mumbai on May 24th and 25th, 2018. The security aspects of electronic signatures are of major importance. For this reason, signotec has decided to exhibit its range of electronic signature solutions at the it-sa India, a meeting place for IT security experts from the South-Asia region. The expo will showcase an extensive range of products and service, comprising all areas of IT security including physical IT security and areas covering research and security consulting. The signotec technologies have been tested and certified by various institutions, e.g. the TÜV Germany. In addition, an independent expert confirmed the usability in the detailed graphic and forensic analysis in the context of a court-validated, scripture-comparative authorship investigation. Result: The signotec electronic signature technology has been proven to be better than the original signatures on paper. In addition to these excellent results, the secure electronic signature on signotec signature pads is also a patented procedure which can be found under the registration number DE102011050156. In contrast to an attached image of the signature, the biometric, handwritten signature links the signature and the biometrics to the document in a way that a manipulation is recognized. The signer can be authenticated based on his biometric parameters, which he gives when signing. The biometrics are an essential component of the signature and are stored in the document in a highly encrypted manner. The document and the biometrics are inextricably linked, which means that any manipulation of the document itself or the signature can be reliably detected. signotec is member of the TeleTrust e.V. and shares a joint booth at the it-sa India. TeleTrust, the IT Security Association Germany, is a widespread competence network for IT security. The exhibition takes place at the Bombay Convention & Exhibition Centre in Mumbai on May 24th and 25th, 2018. 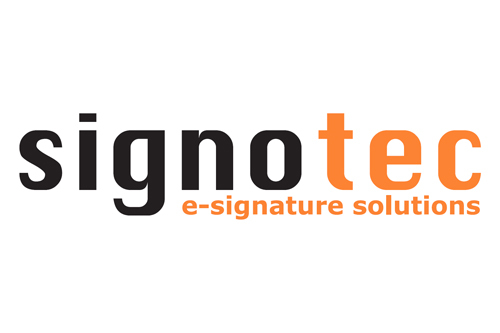 The signotec GmbH founded in 2000 is the leading provider of technology for capturing and processing hand-written signatures electronically. With several hundred thousand licences in place, our software is the top-selling brand on the market. signotec software sets the standard when it comes to processing signatures electronically using signature pads, tablet PCs or mobile solutions for smartphones and tablets. On our customers’ behalf, we develop comprehensive system solutions for any number of application areas. Many thousands of discerning customers have already seen what we can offer. There are very few notable companies that do not yet count themselves among our customers. In a large variety of business sectors, signotec solutions have proved their worth all-round, both in Germany and across the globe.